Less than two months after rolling out payments processing for CBD merchants in the U.S. and Canada, TouchSuite reaches CBD/Hemp merchant account milestone with a 700% increase in account activations. The exponential expansion of the CBD industry is expected to accelerate as a result of the 2018 farm bill. We want CBD manufacturers and distributors to know that TouchSuite is ready to support and process credit card payments via a domestic US-based banking relationship. TouchSuite, a leading provider of fintech solutions in the credit card payments space, created and launched its domestic CBD credit card merchant offering only 47 days ago on Nov. 15, 2018. The demand from CBD businesses to legally accept credit cards from their customers has been overwhelming as TouchSuite has seen a 700% increase in CBD merchant accounts, notably within wellness & beauty shops, nutrition stores, chiropractor practices, and veterinary centers. After the company announced in mid-November the acceptance of CBD merchant accounts in the U.S. and Canadian markets, new applications surged. TouchSuite underwrites merchants selling CBD products online or in a card present setting, and the businesses are boarded via a domestic sponsor bank relationship with complete adherence to regulatory restrictions. 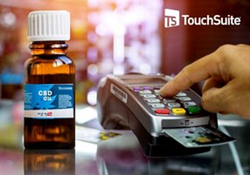 This new credit card processing service offered by TouchSuite has led to a dramatic increase in CBD merchant account activations in the last 30 days. Prior to the TouchSuite CBD credit card program, business owners were left with no choice but to explore unscrupulous, offshore credit card banking relationships which often took advantage of businesses desperate to accept credit cards. With the recent changes brought by the 2018 farm bill, CBD and Hemp products are expected to reach $22 Billion by 2022. By maintaining affordable payment processing fees and facilitating the merchant account domestically, TouchSuite is positioned to enable CBD businesses nationwide to accept credit cards. “The exponential expansion of the CBD industry is expected to accelerate as a result of the 2018 farm bill. We want CBD manufacturers and distributors to know that TouchSuite is ready to support and process credit card payments via a domestic US-based banking relationship,” said Sam Zietz, Chief Executive Officer for TouchSuite. Headquartered in Boca Raton Florida, TouchSuite is a leading financial technology company that delivers business solutions for small to mid-sized companies across different industries. Offerings include point-of-sale systems, payment processing services, SEO solutions, working capital, and marketing services. TouchSuite positions itself as the entrepreneur's partner, delivering solutions that help business owners thrive within the community.